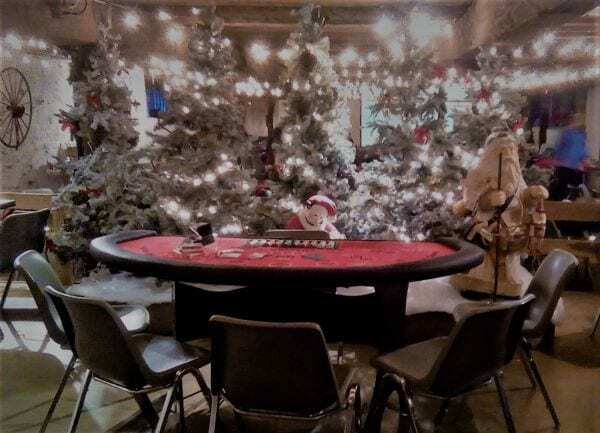 The Korda/Nemeth Engineering company held a casino-themed party holiday celebration at The Barn at Stratford on Dec. 9th, 2016. The party was sponsored by Korda’s Vice-President, Randy Lowe. One-hundred and twenty Korda employees and their guests attended to celebrate another successful year. Korda chose The Barn at Stratford for this event because they were the firm that The Delaware County Historical Society selected to conduct a structural evaluation of the barn when it was first donated to the Society. Korda was taken by the history and warm of the ancient hand-hewn timbers of the 1840s stone-end barn. Venue Manager Connie Hoffman, worked with Korda employees to transform Barn’s gallery. 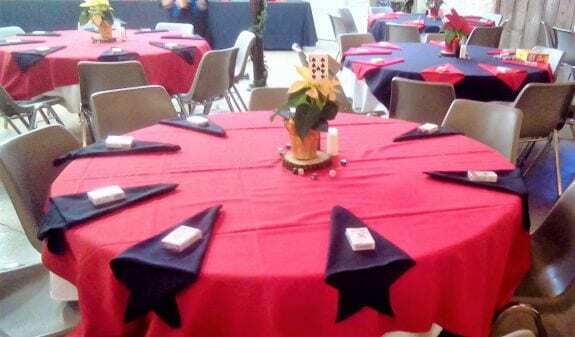 The tables all looked like giant poker chips in red and black with a floral centerpieces. The stage gleamed with a brilliant lighted forest with holiday characters greeting guests. The party’s guests began to arrive around 6:00 p.m. They were greeted and guided to onsite parking by volunteers of the Delaware County Historical Society. Entering the Barn, the guests were offered: appetizers and beverages, docent-led tours of the 1820s Meeker Homestead House, and jugglers providing entertainment for early arrivals. DJ and Master of Ceremonies, Brian Days, provided music together with announcing different events. a Photo Booth with various paraphernalia was open for guests to have souvenir pictures taken. A gift bag lottery announced winners at throughout the evening. Each guest received a lottery ticket attached to their name tag, and the ticket numbers were called to determine the winners. The party officially began at 7:15 with a welcoming announcement from Randy Lowe. After the welcome, the dinner buffet was opened with a delicious selection of Hoggy’s famous foods. At 8:00, everyone gathered for an hour-long magic show was conducted. Magician Chris Yantek held the entire audience’s attention with his easy style and lively banter as he performed various wonders. 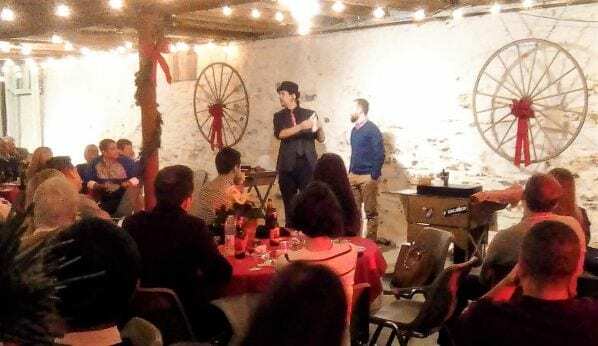 Chris entertained with card tricks, juggling, sword play, some mentalist skills, and more. The audience especially enjoyed his finale act where Chris shredded a guest’s $100 bill. After the show, the gaming tables were re-opened for the guests to play. Roulette and poker were the most popular games of the casino-themed party. 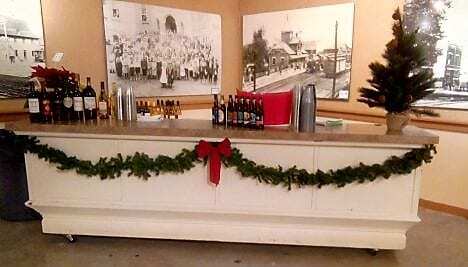 The beverage and dessert bars were opened and the music resumed as the guests continued to party until late. 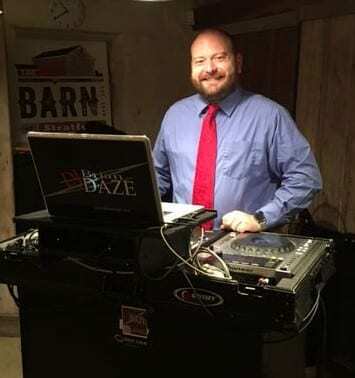 Daze Entertainment, DJ/MC: Brian Days for providing the soundtrack for the entire evening. 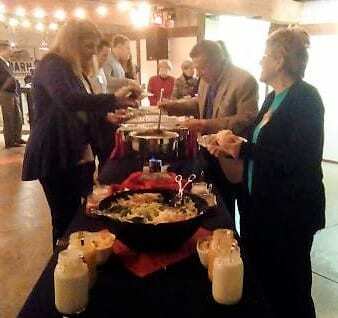 Your organization can have an exciting business event at The Barn at Stratford. Our Corporate Events page will give you more information.